Our Quintrex Top Ender boats are a sports angler’s dream. 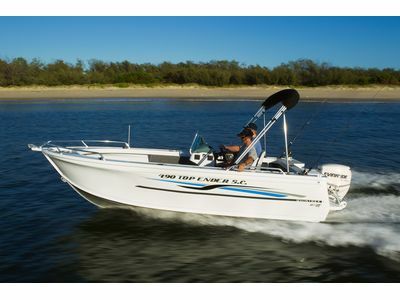 Originally made for the top-end, however it’s popularity sees it being used as a fishing boat across Australia from remote creeks, estuaries and open bays. It features deep sides, blade hull and barra-bass tournament style layout, making your fishing trips smooth and comfortable. Featuring the renowned Blade Hull with the Quintrex Flared Bow, this mid-sized package is guaranteed to out-fish the rest. With full length side pockets and optional storage, this is one practical fishing rig. The 450 Top Ender is available as a side and centre console. With a stable fishing platform complete premium hookless carpet and underfloor storage - fishing with mates and their gear and tackle will never be a struggle. The 510 Top Ender is available as a side or centre console. This roomy boat fits up to five people with a large front casting platform and a large 2.10m beam. With universal front casting platform and interchangeable storage bins, there is more than enough room for all your gear. The 481 Top Ender is available as a side and centre console. Featuring tough 4mm aluminium bottom sheets, carpeted floors, 70lt fuel tank and a live bait tank your day on the water will be complete and in style with a painted hull included as standard. The 490 Top Ender is available as a side and centre console. The 570 Top Ender is sure to impress as a premium fishing boat on the market complete with a massive range of standard features. This model thrives on the power combination of the Blade Hull, Flared Bow and 150hp rating. The 570 Top Ender is available as a side or centre console. 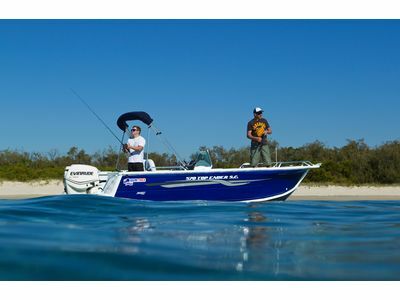 The combination of the Blade Hull and Flared Bow, live bait tank, 95l fuel tank and premium aluminium seat pedestal bases make for one serious fishing machine. The 530 Top Ender is available as a side or centre console.